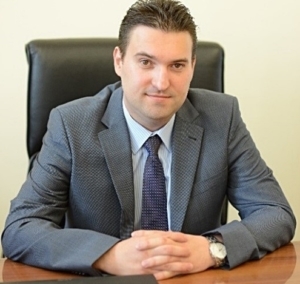 Maxim Klochay is the General Director of the Russian metallurgical and metal-processing company “Ruspolymet”. The company has more than 150 years of experience of working with metals. Maxim Klochay has been leading the company since 2015. He treads in his father’s footsteps Viktor Klochay – Honoured Metallurgist of Russia, who is now the Chairman of the Board PJSC “Ruspolymet”. Maxim Klochay is trying to correspond to his father’s high professional standards in leadership, while to operate with modern international manufacturing management standards. As the CEO, he sees the future of his company in a unique product line, with highly demanded, high quality premium products. This goal will enable the company “Ruspolymet” to become the most expensive company in its segment, in every sense of the word, including its stock-market valuation. Maxim has not much leisure time. However, if he has a chance to relax, he prefers to drive off road-vehicles on extreme tracks, to ski in mountains, or to dive for underwater hunting. And, of course, the best happy moments are related to those hours and days with his family. Martin Schneider (MS): What are your main business values? Maksim Klochay (МК): The reputation of our company is key. It is important what other people think about our company. Maintaining traditions is one of our values. Our slogan is “we are proud of the past, we appreciate the present, we look to the future with confidence – we create together a strong Russia “. Our plant is the heart of a small town, as people say, a one-company town. Therefore, the main business value is our people working with our equipment. We appreciate the best practices of old stagers, we build on their experience. We put a high stake in our talented youth, who will help us to meet our current and future challenges. MS: How do you motivate yourself? MK: First of all, I am trying to keep up with my fathers’ high level of competence and professionalism. Secondly, I want to retain the strong business reputation of our company regarding its modern economic conditions. It is a family business, anyhow. MS: Your father is a well-known person in the Nizhniy Novgorod region and in the country. Now you are in charge of the company. Is it difficult to work under supervision of Viktor Klochay? MK: It is not difficult to work under my father’s supervision. However, repeating my previous statement, that it is challenging to match his high level demands and to meet the high expectations of other people. People are expecting from me the same level of skills as my father’s. This is a challenge which motivates me. MS: What distinguishes your personality from your father’s? SS: Maxim Klochay has been working at our company for more than ten years in different positions. As people say, he grew up in the plant. He knows the entire production process; he studied the technology process from ground up. It allows him to take proper managerial decisions, and to assign clear objectives for his staff. The main part of our company’s investment programme for the modernization of its production have been realized successfully under his leadership. The strategy for “Ruspolymet” for the near- and long-term has been worked out under his supervision as well. Maxim Klochay adds: My father, Viktor Klochay is a true global leader based on his tremendous experience. He defines general goals and objectives. Most important for him is the result. I prefer to sit down with people in order to understand their needs and problems, and to identify the root-cause of problems together. MS: How would you describe your management style? MK: I prefer to listen to employees about problems occurred, and to give them the opportunity to solve them. I interfere only in critical situations when I see things going into the wrong direction or towards a dead-end. For me, it is quite similar to the European management style where every manager is responsible for his results. If employees are given the opportunity to solve problems by themselves, they develop an attitude for being responsible for their own decisions and with that they become more creative. MS: Normally, Russian employees are used to receive orders, to behave according to hierarchy. Now you introduce a new, European-like management style. How do people respond to it? MK: Indeed, people are adapting to my new management style with certain difficulties. It is difficult for them to assume higher level of responsibility. I am trying to convince them that everyone at the company has the power to enhance our business processes. The ability to take decisions is a major criteria when hiring new managers. If a person still does not understand this new approach, he or she is the wrong person for our company. MS: It appears that your management style works. The second consecutive year you got the highest ratings for three basic categories in the ranking “CEO of the Year Russia”. What does this Award mean to you? MK: Firstly, it gives us the understanding where we are situated today in comparison not only with Russian companies, but also with foreign competitors. We present ourselves as a steel producer of international level. It is very important for us to be included in the ranking “CEO of the Year Russia 2017”, especially in the current situation. During the last ten years, the Russian economy have been suffering some crises, and many companies stopped their development plans or closed down. However, we are expanding and developing further. We have completed a remarkable modernization in recent years. We invested more than 200 MEUR! This gave us new impulses. We had no other choice than to investment into modernization, despite of difficult times. I am sure, if we had stopped the push for modernization, our company would not exist anymore. MS: It is remarkable that you managed to obtain such large funds during the current difficult times. MK: Well, we did have problems to secure the investment. Initially we had planned to accomplish the modernization 2-3 years earlier, but were delayed due to financial problems. From the beginning, we received financial state support for our modernization program on preferable terms. Initially, the financing from “Sberbank of Russia” broke down due to the crisis situation in Russia. It took us almost three years to find another bank. Finally, we convinced the VTB24 Bank as our financial partner. The main part of our modernization programme has been completed by the end of 2017. MS: You announced in another interview, that “Ruspolymet” pretends to be the best company not only in Russia, but also in Europe. What does it mean? MK: First of all, we must become more competitive in the steel sector. It is not only about money, it is also about management. Everything we do should meet high standards: from accounting system to business processes. Russia is moving into this direction fast, but we are still lagging behind some European and American companies. MS: What is your international strategy in a nutshell? MK: We move from simple to complicated things. Our goal is to obtain a significant market share for our niche products. We like to penetrate with them industries like aerospace, oil and gas, shipbuilding, atomic and general machinery as these industries are related to us traditionally. Our main challenge is to win European customers. While we lack experience in supplying our goods to Europe, in turn we feel lack of trust by the European companies. Therefore, we must develop individual approaches for each potential customer. This for example may mean to start with a small order in the low- cost product range, and then trading up to premium products based on good delivery and quality performance. For achieving this, we opened our European representative office in Dusseldorf last summer. We believe that it will help us to enter to the European market for general machinery. MS: What is the strategy of Ruspolymet for the next 10 years, what is the next big milestone besides the expansion to Europe? MK: We have two main goals. The first one is related to our production – it is the broadening of our value – added: to produce finished goods, not only semi-finished goods as of today. We started the implementation of this strategy in 2017. In other words, we are planning to move from a metallurgy plant to a machine-building company. We do not want to be the cheapest (semi-finished) product producer, we want to be the most expensive product producer providing high quality products to our clients! The second goal is the improvement of our internal business processes. We have got the best equipment for production. Now, we have to upgrade our technical competence, our people’s competence, in order to match the top equipment standard. MS: How do you take decisions? MK: Better to take a decision, even a wrong one, then not to take a decision at all. MS: How do you spend your spare time? MK: I like extreme sports. For example, I enjoy driving off-road vehicles such as motor bike, car, or a four-wheeler in the forest. As a vacation activity, I would mention skiing and underwater hunting. And of course, I like to spend as much time as possible with my family. MS: What makes you most happy? MK: My children. I have two children: the daughter and the son – 3 and 2 years old.